Everyone has a favourite and nostalgic dish deep in their hearts. For my family, this homestyle stir-fried mushrooms with fermented beanpaste (taucho) dish lovingly prepared by my late mum-in-law who is a teochew, had been, still is and will always be our family’s most treasured dish, as the name of this dish seems to imply. Every bite of these flavourful mushrooms reminisce pleasant memories of my mum-in-law’s skills and efforts in preparing this wonderful dish for all of us. This teochew treasure mushroom is a very popular vegetarian dish, traditionally served and a MUST have for our family on the first day of Chinese new year. It’s also one of my hubby’s favourite! The main star of this dish is the dried black mushrooms (shiitake mushrooms). They are frequently speckled. These mushrooms range in price from moderate to the more expensive.The more expensive ones are called ‘flower mushrooms’ as they have a thick cap and nice curl. However, the cheaper ones are perfectly good for use in soup and stir fries. This is a very simple to cook dish and and the mushrooms add their own special flavour to this dish. 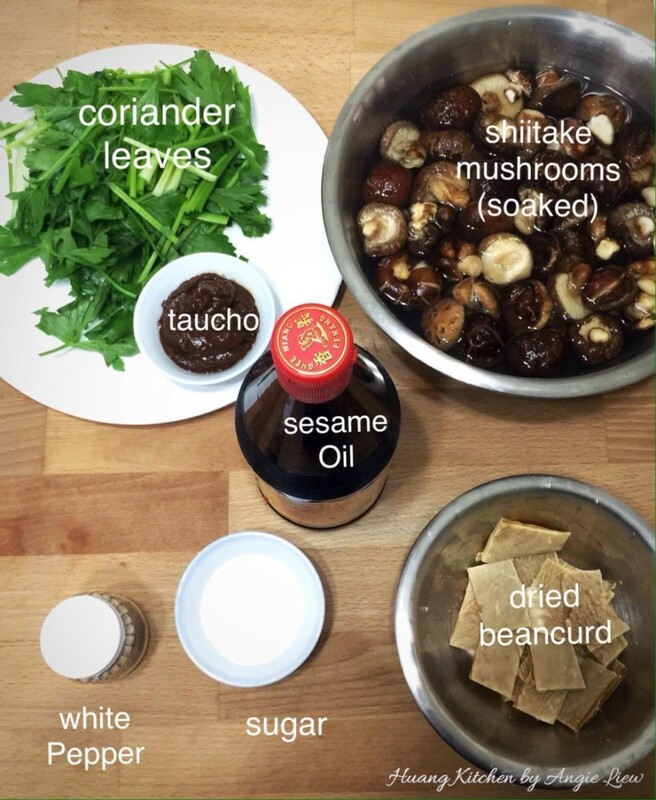 Just stir-fry softened mushrooms with fermented bean paste (taucho) making sure that the mushrooms are fully infused with the flavourful beanpaste (taucho). Then thoroughly mixed the beanpaste infused mushrooms with sweet dried beancurd. And we’re done! Yes, it’s just that simple yet so delicious. 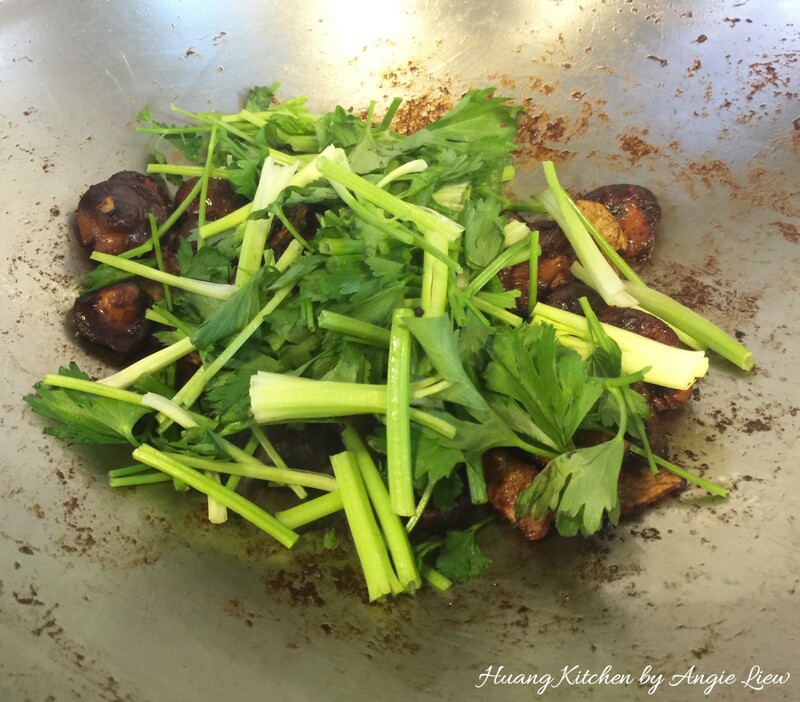 Teochew Treasure Mushrooms is a simple yet flavourful dish. Just stir fry softened mushrooms in fermented beanpaste (taucho) until fully infused. Then mixed with fried sweet dried beancurd for extra flavour. First, have ready all the ingredients for this dish. Soak the dried sweet bean curd sheets in water, until slightly soft. Using a pair of scissors or knife, cut the dried sweet bean curd sheets into thick strips and set aside. Then wash and soak (rehydrate) dried shiitake mushroom in cold water, covered, for 1 - 2 hours or overnight till soft. Alternatively, place the mushrooms in a heatproof bowl and soaked in hot or boiling water for at least 20 minutes until the caps are tender. When the mushrooms have softened, strain and retain 1/4 cup of the mushroom fluid for use later. Then trim off mushroom stems, squeeze out excess water. Rinse and shake dry the coriander leaves. Then using a sharp knife, cut into 2 inch strips, starting from the leaves to the stems. And we're ready to fry the mushrooms. To stir fry the mushrooms, first heat up 1 tablespoon sesame oil in a wok. Add in the shiitake mushrooms and stir fry over medium heat until fragrant and caps are fully infused with the sesame oil, about 5 minutes. Dish up and set aside the mushrooms. In the same wok, heat up another tablespoon of sesame oil. Add in the dried sweet beancurd strips and stir fry the beancurd in the oil until slightly browned, about 3 minutes. Dish up and set aside the fried sweet dried beancurd strips. Then add in fermented bean paste and stir fry for about 1 minute. Quickly add the sesame oil infused fried shiitake mushrooms. Fry to make sure the mushrooms are coated with the bean paste. Then add in sugar and continue to stir fry for another 1 to 2 minutes. Add a dash of ground white pepper. Then pour in retained mushroom fluid. Cook, stirring occasionally, until the mushrooms are tender, fully flavoured and the fluid has dried up. Next, add the fried sweet beancurd strips. Lightly toss to mix the sweet beancurd with the flavoured shiitake mushrooms. Lastly, toss in the cut coriander leaves. Lightly mixed to fully combine the coriander leaves with the mushrooms and sweet beancurd. And we're done! Serve this flavourful mushroom dish hot with steamed white rice. And as always, ENJOY! It is best to soak the mushrooms in lots of cold water, covered, for 1 - 2 hours or overnight. Soaking in hot water takes less time, but this causes the mushrooms to lose much of their characteristic fragrance. Dried mushrooms can keep for many years if stored in a dark and dry place.